This section describes how to configure EclipseLink for use with Java EE containers and application servers. EclipseLink can be used with any Java EE application server that meets the software requirements through the EclipseLink API. Application servers use an XML parser to read deployment files, such as ejb-jar.xml and <Java EE container>-ejb-jar.xml files (see Creating EclipseLink Files for Deployment). To avoid XML parser conflicts, you must configure your EclipseLink application to use the same XML parser as that used by the application server on which you deploy your application. Internally, EclipseLink accesses its XML parser using an instance of org.eclipse.persistence.platform.xml.XMLPlatform class. You can configure EclipseLink to use any XML parser for which an XMLPlatform class exists (see Configuring XML Parser Platform). You can also create your own XMLPlatform to provide access to an XML parser not currently supported by EclipseLink (see Creating an XML Parser Platform). EclipseLink provides the XMLPlatform instances shown in the following table. Note: To use an XML parser not listed in this table, create your own XMLPlatform (see Creating an XML Parser Platform). To configure your EclipseLink application to use a particular instance of the XMLPlatform class, set system property eclipse.persistence.xml.platform to the fully qualified name of your XMLPlatform class, as the following example shows. Using the org.eclipse.persistence.internal.xml classes you can create your own instance of the org.eclipse.persistence.platform.xml.XMLPlatform class to specify an XML parser not listed in the Supported XML Platforms table. After creating your XMLPlatform, configure EclipseLink to use it (see Configuring XML Parser Platform). By default, when you run a EclipseLink-enabled application in a JVM configured with a nondefault java.lang.SecurityManager, the EclipseLink run-time environment executes certain internal functions by executing a PrivilegedAction with java.security.AccessController method doPrivileged. This ensures that you do not need to grant many permissions to EclipseLink for it to perform its most common operations. You need only grant certain permissions depending on the types of optional EclipseLink features you use. For more information, see Defining Security Permissions. If you run a EclipseLink-enabled application in a JVM without a nondefault SecurityManager, you do not need to set any permissions. Most application servers include a clustering service that you can use with your EclipseLink application. Install the eclipselink.jar file (and include it in the classpath) on each application server in the cluster to which you deploy EclipseLink applications. Configure EclipseLink cache consistency options appropriate for your application. In addition to configuring these Oracle WebLogic Server-specific options, you must also consider the general application server integration issues in Integrating EclipseLink with an Application Server. Ensure that your EclipseLink application defines an XML parser platform (see How to Configure the XML Parser Platform). For applications that require JTA integration, specify the external transaction controller when you configure the server platform in your session (see Configuring the Server Platform). For more information, see Integrating the Unit of Work with an External Transaction Service. org.eclipse.persistence.services.DevelopmentServices - This class is meant to provide facilities for managing an EclipseLink session internal to EclipseLink over JMX. org.eclipse.persistence.services.RuntimeServices - This class is meant to provide facilities for managing an EclipseLink session external to EclipseLink over JMX. Use the API that this JMX MBean exposes to access and configure your EclipseLink sessions at run time using JMX code that you write, or to integrate your EclipseLink application with a third-party JMX management application, such as JConsole. Set breakpoints: the eclipselink.jar deployed in the $WEBLOGIC_HOME/modules/org.eclipse.persistence_n.n.n.jar needs a source attachment. You set a breakpoint on the undeploy method of the org.eclipse.persistence.internal.jpa.EntityManagerSetupImpl pointing to the source JAR file or your workspace projects, and then redeploy. This will result in any breakpoints set in the predeploy method or prior to the first login to be hit. By default, EclipseLink does not register MBeans for Oracle WebLogic Server. If you enable the registration, it will occur as a post step during the first login to the session (see Configuring a Session Login). If both eclipselink.register.dev.mbean and eclipselink.register.run.mbean properties are missing, MBean registration will not proceed for that bean. Configure Oracle WebLogic Server domain security. For more information, see EclipseLink JMX MBean Support in Oracle WebLogic Server tutorial. After you deploy your EclipseLink application, you can use any JMX-compliant management application to access and use the full public API that EclipseLink MBeans provide. Package and deploy your EclipseLink application to Oracle WebLogic Server. For more information, see Deploying an EclipseLink Application. Optionally, examine Oracle WebLogic Server logs and look for the appropriate log messages. Note that for a JPA application, EclipseLink session instantiation and login occurs at EntityManager instantiation time. Launch your third-party JMX management application. 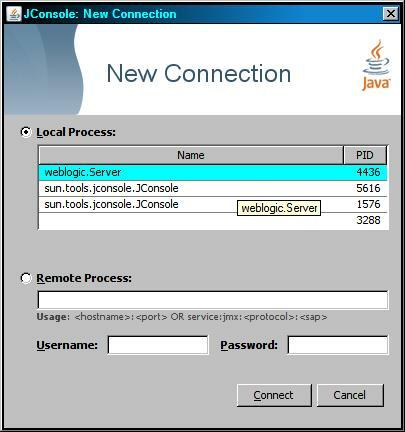 For example, launch JConsole (JDK_HOME\bin\jconsole.exe) using the command prompt, and then select the running weblogic.Server local process, as the following figure shows. Optionally, launch JRockit Mission Control JMC.exe, attach to the JVM process and navigate to the MBeans tab - you will see the following screen showing the EclipsLink MBeans for your session. There are a number of ways to disable EclipseLink JMX support. Undeploy your EclipseLink application on Oracle WebLogic Server. Edit your EclipseLink application’s Oracle WebLogic Server platform to disable run-time services. For more information, see Configuring the Server Platform. Package your EclipseLink application and redeploy on Oracle WebLogic Server. Confirm that EclipseLink JMX MBean instances for your application no longer exist. If your application does not include an EclipseLink sessions.xml file, you can use a preLogin event handler to disable this feature (see the following section). Create an EclipseLink session customizer. In your session customizer, create a session event listener for the preLogin session event and register the listener with the session event manager, as the following example shows. Package your EclipseLink application, including your session customizer, and redeploy on Oracle WebLogic Server. For more information, see Packaging an EclipseLink Application and Deploying an EclipseLink Application. Confirm that EclipseLink JMX MBean instances for your application are not deployed. Note: Follow the preceding procedure if you EclipseLink application does not include an Oracle WebLogic Server sessions.xml file (such as a EclipseLink JPA application). The WebLogic installation procedure includes a sample security policy file. You need to edit the weblogic.policy file to grant permission for EclipseLink to use reflection. The following example illustrates only the permissions that EclipseLink requires, but most weblogic.policy files contain more permissions than are shown in this example. To integrate a EclipseLink application with OC4J, you must consider integration with the OC4J JTA. In addition to configuring these OC4J-specific options, you must also consider the general application server integration issues described in Integrating EclipseLink with an Application Server. In addition to configuring these IBM WebSphere application server-specific options, you must also consider the general application server integration issues in Integrating EclipseLink with an Application Server. Create a shared library that contains the <ECLIPSELINK_HOME>\jlib\eclipselink.jar file and associate the shared library with the application. If you are deploying a EclipseLink enabled application that uses EclipseLink sessions.xml or XML project deployment, you must use the WebSphere Application Server Administrative Console to set Class loader order to Class loaded with application class loader first. For information on integrating a EclipseLink application with an application server cluster, see How to Integrate Clustering. In addition to configuring these SunAS-specific options, you must also consider the general application server integration issues in Integrating EclipseLink with an Application Server. Add the <ECLIPSELINK_HOME>\jlib\eclipselink.jar file to the application server classpath. In addition to configuring these JBoss-specific options, you must also consider the general application server integration issues in Integrating EclipseLink with an Application Server. For JPA applications, to enable the container to manage entities, statically weave the entities and reference JBoss as the target server in the persistence.xml file. If weaving is required, statically weave the entities before EAR packaging. Use either the command-line weaver or the weaving Ant task (see How to Configure Static Weaving for JPA Entities). In addition to configuring these NetWeaver-specific options, you must also consider the general application server integration issues in Integrating EclipseLink with an Application Server. Create and deploy a standard library (i.e. an SDA file) that contains the <ECLIPSELINK_HOME>\jlib\eclipselink.jar file and associate the library with the application. For applications that require JTA integration, specify the external transaction controller when you configure the server platform in your session. See Configuring the Server Platform for general information on configuring the server platform and EclipseLink/Development/ServerPlatform/NetweaverPlatform for a description of the NetWeaver server platform. By default, when you run a EclipseLink-enabled application in a JVM configured with a nondefault java.lang.SecurityManager, the EclipseLink run time executes certain internal functions by executing a PrivilegedAction with java.security.AccessController method doPrivileged. This ensures that you do not need to grant many permissions to EclipseLink for it to perform its most common operations. You need only grant certain permissions depending on the types of optional EclipseLink features you use (see How to Define Permissions Required by EclipseLink Features). While using doPrivileged method provides enhanced security, it will severely impact overall performance. Alternatively, you can configure EclipseLink to disable the use of doPrivileged method even when a nondefault SecurityManager is present (see How to Disable doPrivileged Operation). In this case, you must grant EclipseLink all required permissions (see How to Define Permissions Required by EclipseLink Features and How to Define Permissions Required when doPrivileged Is Disabled). Note: While enabling the use of doPriviledged method enhances EclipseLink application security, it does not guarantee that secure code cannot be called by application code in ways that the system did not intend. You must consider the use of doPriviledged method within the context of your overall application security strategy. For more information, see http://java.sun.com/security/index.jsp. If you run a EclipseLink-enabled application in a JVM without a nondefault SecurityManager, you do not need to grant any permissions. By default, a EclipseLink-enabled application requires access to the system properties granted in the default <JAVA_HOME>/lib/security/java.policy file. If your application requires access to other platform-specific, environment, or custom properties, then grant further PropertyPermission permissions, as the following example shows. Most EclipseLink-enabled applications read in project.xml and sessions.xml files directly. Grant permissions to the specific files or file locations, as the following example shows. This example assumes that both project.xml and sessions.xml files are located in the same directory (given by application-specific system property deployment.xml.home). Alternatively, you can specify a separate FilePermission for each file. For information on FilePermission settings for Java EE applications, see Granting Permissions for Java EE Application Deployment. If your application uses cache coordination (see Cache Coordination), then grant accept, connect, listen, and resolve permissions to the specific sockets used by your coordinated cache, as the following example shows. This example assumes that the coordinated cache multicast port (see Configuring a Multicast Port) is 1024. If your EclipseLink-enabled application accesses a data source using a socket, then grant connect and resolve permissions for that socket, as the following example shows. This example assumes that the host name (or IP address) of the remote host that provides the data source (such as a relational database server host) is given by application-specific system property remote.data.source.host and that this host accepts data source connections on port 1025. If you configure your EclipseLink-enabled application to use java.util.logging package (see Configuring Logging), then grant your application control permissions, as this example shows. You may also have to grant additional permissions depending on the EclipseLink features your application uses. For more information, see How to Define Permissions Required by EclipseLink Features. To disable doPrivileged operation when you run a EclipseLink-enabled application in a JVM configured with a nondefault java.lang.SecurityManager, set system property oracle.j2ee.security.usedoprivileged to false. If you are using OC4J, set system property oracle.j2ee.security.usedoprivileged to false. This page was last modified 11:21, 18 July 2012 by Rick Sapir. Based on work by Craig Ringer, Michael OBrien and Sabine Heider and others.